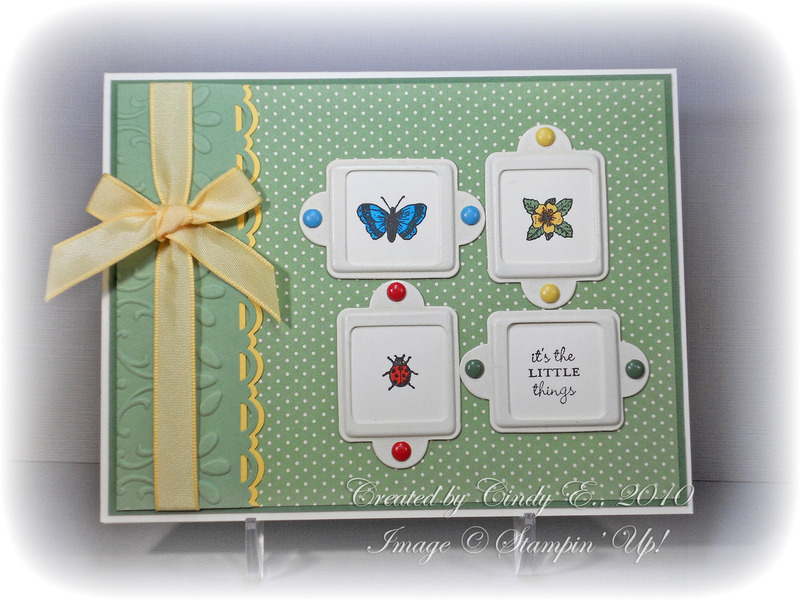 .... brought to you by the good folks at Stampin' Addicts, where their motto is "Positively Creative. Positively Stampin' Up!" 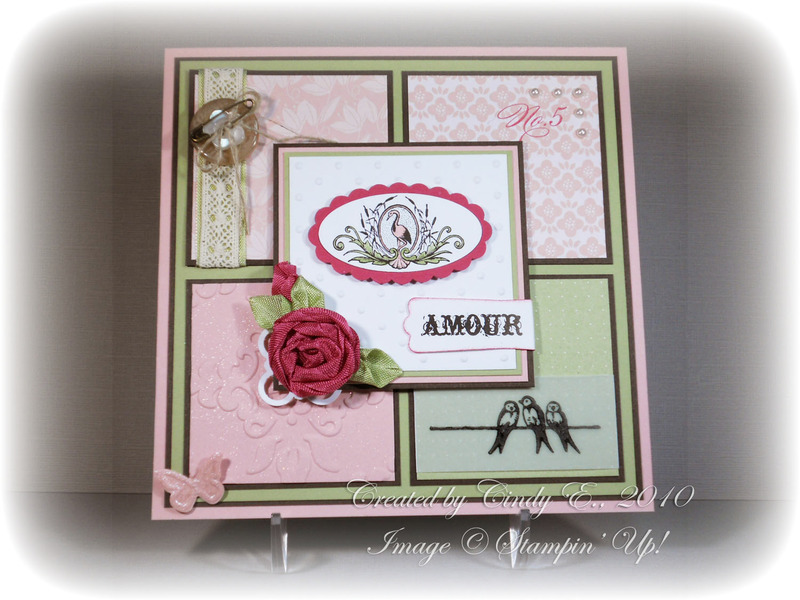 This time we are previewing some of the fabulous goodies in the new Stampin' Up! 2011 Occasions Mini Catalog, which starts January 4th. Today I am showing some ideas for the Clearly for You stamp set. I'm so glad you stopped by, and hope you have been wowed and inspired by the hop so far! If you are following the hop in order, you just arrived from Holly's blog, Rubber Redneck, where the Nature Walk stamp set was featured. At the bottom of this post, you can click to go back, or forward to the next blog on your journey! First up is a clean and simple (CAS) card using the little background stamp and the bird (egret? flamingo?) stamp. Quick, easy and elegant! I don't know about you, but I am burned out on Christmas colors, so I wanted to try something bright and cheery for the next card. I'm thinking spring, summer, gardens, SUNSHINE! So this next card combines the colors of summer with some of the things you might find in a garden. Up next, I went to the opposite extreme and tested my "vintage" mojo. Lately my style has been trending toward the CAS look, but this was soooo much fun to make (how much "shtuff" can I cram on one card? ), I want to do more! And lastly, the whole reason I was sold on this stamp set as soon as I saw it........BERRIES! We have a prolific boysenberry plant, so I make lots of jam and pancake syrup. I absolutely fell in love with this little stamp! You could make it raspberry or blackberry, depending on how you colored it. Anyhoo, this is a little gift set I thunk up. 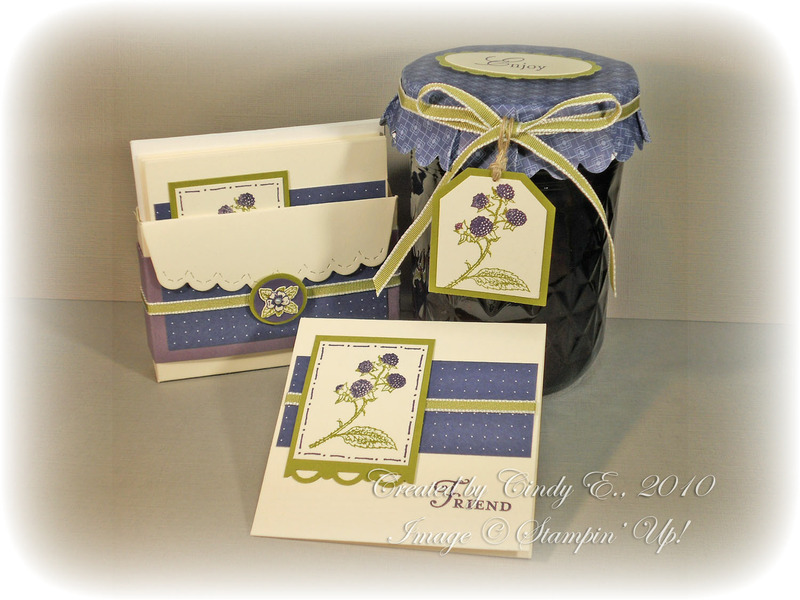 The jar topper uses Concord Crush DSP from the In Color Patterns Pack hostess gift. I got a lot of use out of that pack of paper for these projects! 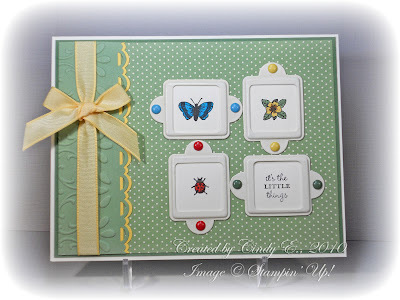 The little set of 4 cards with envelopes is tucked in a box made using the Scallop Envelope Die. Well, that's all for this stop! Click on the link below to get to your next stop, which is Sunflower Stamper Jennifer, featuring Bold Blossom. a safe, Happy New Year! Really cute projects, especially the last one. The egret (I vote egret) and berry images in this set really get me! Your projects are gorgeous, as always. OMGosh, how many embellishments can you fit on that 3rd project??? I love the jam idea! Wow, I didn't even notice that egret before! I love it! And your berry gift set is amazing! Wowza!! I love everything and now this set is on my must have list!! Gorgeous projects Cindy!! I love how you showed the versatility of this set by using it with so many different styles. My favorite has to be the berry cards. Or maybe I'm just craving that yummy looking jam. :) Wonderful job!! So beautiful and bright! Your projects are awesome! LOVE the boysenberry jam set!!! Oh Cindy! How cute! My favorites are the second card and the gift set! I'm tired of winter, too! Great job! Oh Cindy....I love all your projects!! This is one of my fav sets from the mini and you really did a great job with it. I sooooo love the colors on the sunshine card. Love the offset scallop border with the yellow. Super love the note card and Jam set too! I gotta be able to get this set. Enabler alert ... this set is now added to my "must have" list. I love each and every project, and that gift set is amazing! You have outdone yourself again!! I can't choose a favorite but the card with the hardware is brilliant. The jam packaging is stunning! LOVE your projects, Cindy!! The cards are beautiful and the gift set is absolutely lovely. You have an eye for the little details. I love layout of the second card especially. Love everything, Cindy. Love that gorgeous ribbon flower on the third one, and the final berry project is wonderful! Beautiful projects!! all of them are wonderful-love the gift set!! Beautiful projects! You've done a great job showing off this nice stamp set. Thanks! Cindy this is WOW!! I love everything you did with this set! I love your last group of projects!! Ooooh! The gift set is fabulous! (We have raspberry bushes, and I make jam.) I'm looking forward to getting this set at Leadership and CASEing your beautiful work! Very cool. I love them all. The berries are my favorite though. Well, that and those colored brads on the window panes. Ahh. So cool! Beautifully done Cindy! I too got this set for the berries. Love your HPH card the most. Nothing says 'amour' like a stork lookin' for a place to go. WOW!! Your projects are awesome. I love them all. Great projects, but I really love the "berries" set! Wowzers on the projects Cindy! I love the combination of images and "shtuff"! Very clever use of the hodgepodge hardware. Love the boysenberries too! Though where I used to live we had Ollaberries that everyone thought were really big, really tasty boysenberries. But when you put the O name on the menu people had no idea what they were so we used the B word instead. Hah...no truth in advertising there! Rat's...now I'm hungry for berries and its the wrong time of year here in Oregon! Wonderful projects! I love the variety of styles you showcased, and the first CAS card really caught my eye! Holey Shamoley, Cindy! Your projects are just awesome! I can't decide which one I like the best, but if I had to, I'd vote for the one with the square frames. How cool is that??!!?? Please check my blog post for today. I'm passing on the Stylish Blogger Award to you in recognition for the great inspiration you provide to me in stamping. Thanks so very much for your great work. I'm following you through Stampin' Connection. I'm #302. Wow Cindy, what a great set of projects. My favorite has got to be the card with the little blue birds. Beautiful projects, Cindy! I'm so glad I ordered this set.. can't wait til it gets here! :) And boysenberries... lucky you! !